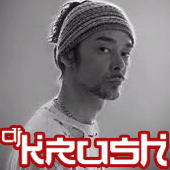 I discovered DJ Krush on monkeyradio.org, which is where I discovered a bunch of my favorite artists. Hideaki Ishi (石 英明 Ishi Hideaki?, born 1962 in Tokyo, Japan), better known by his stage nameDJ Krush, is an alternative hip hop producer andDJ. He is known for his atmospheric instrumental production which incorporates sound elements from nature and extensive use of jazz and soul samples.